Welcome to the high-end side of the mid-range SE phones! Sunils120 from Esato has a beautiful concept for us, the S602, that you can check out in the picture below. We’re dealing with a handset that comes with a 3.2 megapixel autofocus camera (with geotagging and face detection) plus a Walkman 3.0 Media Player with Megabass. 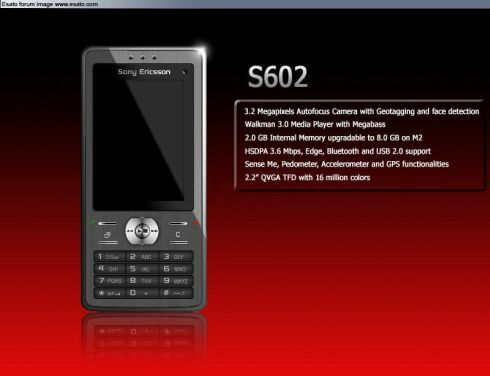 The S602 features a 2.0 GB internal memory, plus the possibility of expanding it to 8.0 GB with the aid of an M2 Memory Stick. On the connectivity side we find the HSDPA (3.6 Mbps), EDGE, Bluetooth and USB 2.0 support, while the specs list also includes Sense Me, a pedometer, accelerometer and GPS. Last, but not least we must mention the display of the phone, a 2.2″ QVGA TFD with 16 million colors.